Guess what! 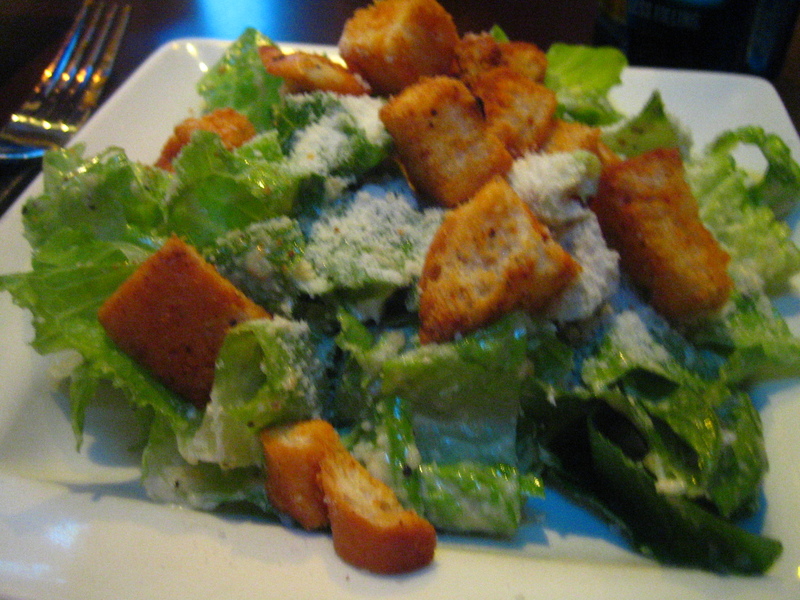 I ate a salad over the weekend! You are absolutely correct if you think that this is nothing to be impressed by. But somehow the weekend plate of greens has become a rare sighting around these parts. Maybe my caveman instincts are kicking in and I’m trying to pack on some extra insulation for the cold winter months. But now I’m going to get all physics on your asses. Remember Newton’s Laws of Motion? Remember that one that says “every action has an equal and opposite reaction”? Yeah, I was really good at physics. I realize that this pizza is not going to win any beauty contests any time soon (but why would you want a pizza to? The swim suit competition would be disgusting. ), but it was a damn fine pizza. Or flatbread. The menu at Vines called it a pizza, but this is Chicago. 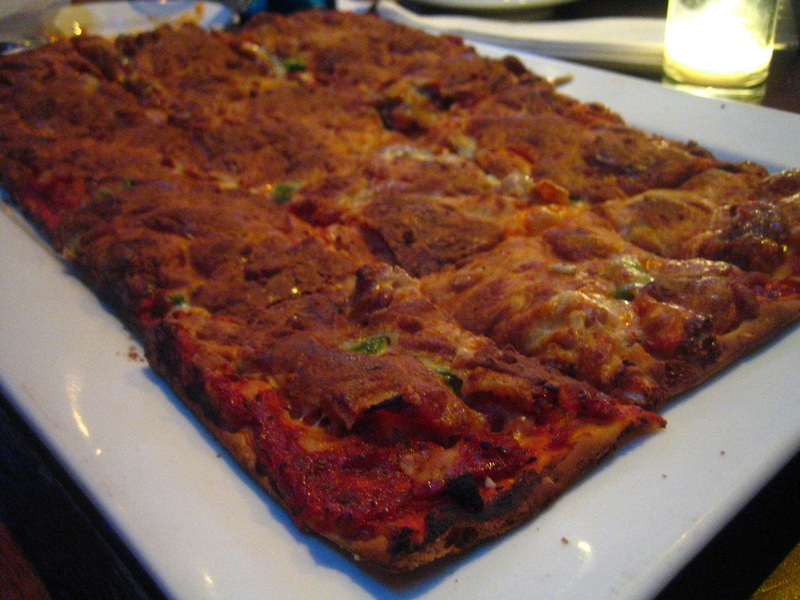 The crust was flat and crispy, ergo it is a flatbread. This was the “spicy” pizza. Sausage, pepperoni (I’m telling you- that Newton’s law thing is alive and well), jalapenos, pepper jack cheese and sriracha infused pizza sauce. Oh yes. I’ve said it before and I’ll say it again: sriracha is good in everything. This could be really bad. At least sriracha itself is healthy. Vines really is one of my favorites. Not to mention, so conveniently located as a stop btwn other bars on those late nights… yesssss…. 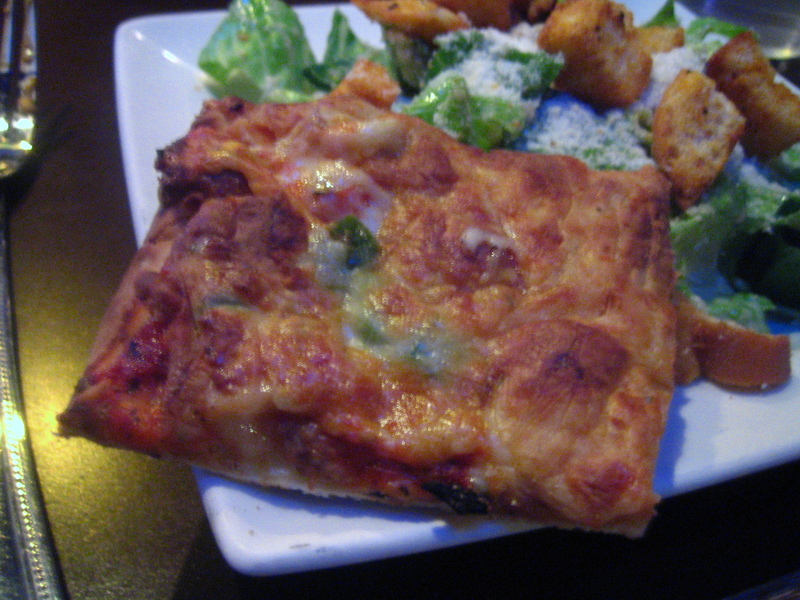 Pizza and salad should be a weekly tradition in households across America. I refuse to admit there is a more delicious combo that exists. And throw a glass of wine in there or a cold beer? Pssshhht. Doneski. That pizza sounds pretty amazing. Of course, I’ve never tasted sriracha before, so I’m just assuming. Siracha in the sauce!? I am having a pizza party next weekend and I’m going to try my hand at this bad boy- I’ll keep you posted! Sriracha really is good with anything. I’m loving the sound of a sriracha cocktail! sriracha infused sauce?!!? I need this! I am totally packing on some insulation pounds. I heard this winter is going to be the worst ever so I’m going to need every extra ounce. So you’re saying we should go there together? Why yes, I agree.